Francis Basset (1757–1835) likely commissioned Thomas Gainsborough to paint this pair of portraits depicting himself and his wife, Frances Susanna Coxe (c. 1760–1823), soon after he purchased their new home in 1785. The paintings adorned the stately Radnor House, built in 1673 on the banks of the River Thames in Twickenham, which Basset owned until 1793. A native of Cornwall, the southwest tip of England, Basset married Bath-born Frances in 1780, one year after he was made a baronet for defending the English coast against French and Spanish fleets. By the time the couple sat for Gainsborough, Basset had been representing his native Cornwall in Parliament for five years. He balanced his political ambitions with business concerns, playing an instrumental role in the development of railroads essential to Cornwall’s maritime and mining industries. 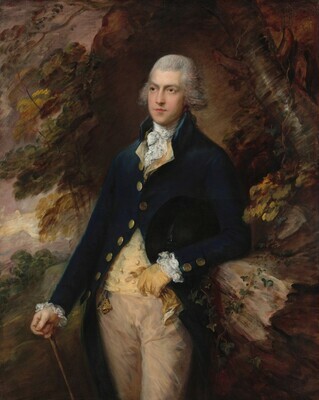 Gainsborough was the favorite English society portrait painter of his era. Like other British portraitists succeeding Anthony Van Dyck, the leading English court painter of the early 18th century, Gainsborough was strongly influenced by the Flemish master’s elegant yet relaxed likenesses. This pair of portraits exemplifies Gainsborough’s mature style, in which he developed a new, romantic approach to the genre. He rendered his subjects with loose, animated brushwork and enveloped them in wild landscape settings painted in a similarly impressionistic style. In this instance, Gainsborough connects the Bassets—born as commoners and therefore newcomers to wealth and society—directly with the natural world so important to their country’s landed aristocracy. Frances Susanna’s lace- and pearl-trimmed yellow and blue gown—exemplifying Gainsborough’s reputation for brilliantly rendering the silks and satins of women’s dresses—and the feathers in her hat and hand indicate that the nostalgia for the former court painter held sway not only in portraiture but also in the fashion for attending parties in “Van Dyck dress.” The diaphanous wrap edging her garments plays a key role in integrating her figure into the wooded background. Barely visible along her right side but cascading down from her left hand and over the rock or tree stump on which she rests her elbow, the fabric seems to dissolve into the landscape. Likewise, her cascading curls are rendered in shapes echoing those of the nearby foliage. In contrast, and in keeping with his political and business ambitions, Francis is dressed in contemporary style and rendered more distinct from his landscape background. A.F. Basset, London; sold 1907 to (Asher Wertheimer, London). (Thos. Agnew and Sons, London), in 1908. Sir George Donaldson [1845-1925], London; sold to William Andrews Clark [1839-1925], New York, by 1916; bequest 1926 to the Corcoran Gallery of Art, Washington; acquired 2014 by the National Gallery of Art. The date of the Basset sale to Wertheimer, and the date when the painting was with Agnew's were provided by Ellis Waterhouse; see Corcoran Gallery of Art accession records, in NGA curatorial files. Letter, 27 March 1916, Clark to C. Powell Minnigerode of the Corcoran Gallery of Art, in which he mentions the two Gainsboroughs that Minnigerode "saw in my gallery"; copy in NGA curatorial files. Loan Exhibition. Masterpieces of the Corcoran Gallery of Art: A Benefit Exhibition in Honor of the Gallery's Centenary, Wildenstein, New York, 1959, unnumbered catalogue, repro. The William A. Clark Collection, Corcoran Gallery of Art, Washington, 1978. Antiquities to Impressionism: The William A. Clark Collection, Corcoran Gallery of Art, Washington, 2001-2002, unnumbered catalogue, repro. Carroll, Dana H. Catalogue of Objects of Fine Art and Other Properties at the Home of William Andrews Clark, 962 Fifth Avenue. Part I. Unpublished manuscript, n.d. (1925): 140, no. 88. Corcoran Gallery of Art. Illustrated Handbook of The W.A. Clark Collection. Washington, 1932: repro. 38, 47, no. 2094, as Portrait of Lord Dunstanville. Waterhouse, Sir Ellis. Gainsborough. London, 1958: 64, no. 219. Corcoran Gallery of Art. Masterpieces of the Corcoran Gallery of Art. Washington, 1959: 19, repro. Sánchez-Jáuregui, Maria Dolores. "Two portraits of Francis Basset by Pompeo Batoni in Madrid." The Burlington Magazine 143, no. 1180 (July 2001): 425, fig. 20.